Castle Comfort Stairlifts offers top brand stairlifts, keen prices and fast installs for all those seeking stairlifts in Musselburgh, Lothian . And all work comes with our no-quibble guarantees and famous customer service satisfaction. Whether you live north or south of the border, when it comes to losing your mobility none of us want to shout about it! Castle Comfort Stairlifts, a family run firm who have 15 years experience in the business of supplying stairlifts know just how important regaining some control is! If you live or have loved ones who live in the Musselburgh area we are happy to help. 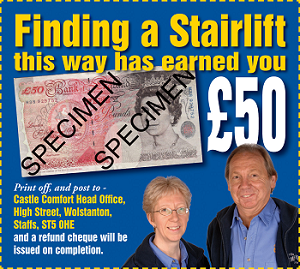 We can assess which stairlift works best for you and your staircase so that you can regain your mobility safely again. Take a look at prices and stairlift possibilities on our site and also the possibilities of grants or 0% finance to fund a stairlift. If you still have questions, give our local office a call on 0131 242 0046 . Just take the A1 east out of Edinburgh and you’ll find yourself in Musselburgh in less than 6 miles. Musselburgh which is in East Lothian is the largest town in the area. It is located on the southern shore of the Firth of Forth and is close to several other water-fronted towns and villages. In fact Musselburgh gets its name from the massive mussel beds along that stretch of the shoreline. The town is known as ‘The Honest Toun’ following an act of kindness – or duty – when the townsfolk cared for the sick Regent of Scotland, Randolph the Earl of Moray who later died back in the 14th century. Nowadays to honour this name they celebrate every year by electing an ‘honest lad and lass’ during the annual Honest Toun Festival. Every 21 years, the Riding of the Marches occurs. This tradition involves a band of local men riding to check the 12 boundary points of the burgh or town. They are led by one of the band dressed in full armour. This ceremony dates from the 17th century when rival land owners often encroached on one another’s land. The Lairds in the area conscripted local men to protect their boundaries. Musselburgh has a traditional song which celebrates its existence and longevity – ‘Musselburgh was a burgh when Edinburgh was nane, and Musselburgh will be a burgh when Edinburgh is gane’. A local delicacy is almost a tradition too, S Luca ice-cream. The S stands for Scappaticcio the original family name! The company has been making ice cream and selling it for more than 100 years. The company is still family owned and it is now mainly the third generation which are continuing the tradition with their great Italian ice cream and signature ice-cream cakes. They still have ice cream vans servicing the surrounding areas including the seaside town of North Berwick. Newhailes House, a 17th century building was built by architect James Smith in the Palladian style. It was sold to Sir David Dalrymple when Smith got into financial troubles some years later. Dalrymple made extensive changes to the building, which remained the family home until recently when it was bought by the National Trust for Scotland. Visitors will find the house has a ‘lived in’ feel – not everything is pristine. You can still find Chinese wallpaper in the dressing room and china in the china cabinet; the library is now devoid of books though there are some books piled in other rooms. The dining room is still impressive. The parklands that surround the house fill up much of the land between Edinburgh and Musselburgh. There are great walks through the woodlands and superb views across the Firth of Forth. The racecourse at Musselburgh was known as Edinburgh Racecourse until the 1990’s. Back before 1816, the very first races were held on the sands at Leith but moved over to Musselburgh after that. It’s a small racecourse with a length of about 2 miles hosting around 24 fixtures each year. Amongst these are a number of seasonal favourites including a New Year’s Day event, the Easter Festival, Edinburgh Cup Day and a Ladies Day sponsored by Jenners and Frasers, two Edinburgh retailers. Already this year the racecourse has been awarded the BetView Award for Racecourse of the Year, awarded for providing the best experience for both the ‘betting and the racing public’; last year it notched up two awards, the Racecourse Association Award for ‘Operational Excellence’ and the Neil Wyatt Groundstaff of the Year Award for the best dual purpose racecourse. Footballers seem to flourish in Scotland! Kenny Miller now playing for Cardiff City grew up here; as did Colin Nish (Hartlepool United) and Jason Holt; Kris Renton was born here and played for the local team until earlier this year; the late John white (Tottenham Hotspurs) was also born here. Athlete Yvonne Murray was born here. Comedian Rhona Cameron grew up in Musselburgh; actor James Martin (Still Game) was born here. The late sculptor Alexander Carrick was born here. Many of his works can be seen in Edinburgh: Sir William Wallace at the Castle; ‘Security’ on the Caledonian Insurance building; ‘Geology’ on Kings Building at Edinburgh University. The original fishing village of Musselburgh’s harbour is Fisherrow on the banks of the River Esk. Fishing has happened here as long ago as Roman times. The current harbour (18th century) is close to the original Roman harbour which was close to Inveresk Roman Fort, which is no longer there. The typical catch of the large fishing fleet at Fisherrow was initially herring and later, white fish, prawns and sprats. Fishing stopped when the Firth of Forth became a strategic base for the military services in 1939. Nowadays, it is mainly pleasure boats that populate the harbour. Between the harbour and the mouth of the River Esk is Fisherrow Sands. Just south of Musselburgh you will fink Inveresk, now a conservation area. As we mentioned above this was the location for a Roman fort on the elevated ground. Although the fort is no longer there, 17th & 18th century houses can be seen in one street. Inveresk Lodge Garden is now owned by the National Trust for Scotland so that they can be enjoyed by all, though the lodge itself remains privately owned. You’ll find another small fishing village along the Firth of Forth at Cockenzie and Port Seton, once two small villages that are now combined. There is still a small fishing fleet here, mainly fishing for prawns. Mary, the Crown Princess of Denmark’s origins are in Port Seton; her father John Dalgleish Donaldson was born here in 1941; Sir Walter Scott’s publisher Robert Cadell lived here and the artist John Bellany was born here. Further east is North Berwick a traditional seaside town. One of the nearby islands Fidra is thought to be Robert Louis Stevenson’s inspiration for Treasure Island. Robert spent many family holidays in the area. It was the family home of another author, William Dalrymple; his father is the current 10th Baronet of North Berwick. Golfers Willie Anderson, Ben Sayers, David Huish and Catriona Matthews all have their roots in North Berwick. Whatever your roots in this part of the world, if getting up and down those stairs is a problem, Castle Comfort Stair Lifts can help. 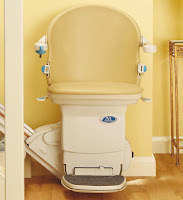 Which ever stairlift suits your purposes best – straight, curved, platform – we can supply and install in next to no time. We can even help with commercial platform lifts or for those of you of bigger proportions we can help with a bariatric lift. Where there’s a will there’s a way! If like those who’ve already found a stairlift to be a blessing and there are at least 100 in the area, you feel the need, please give us a call on 0131 242 0046 so that we can help sooner rather than later.